Quilt Description: A memorial to my mother who died when I was seven. It is probably the most revealing and personal quilt I've ever made. Lots of raw edges of fabrics were left exposed and uneven to represent the raw emotions that this subject brings out in me. The gray fabric strips in the background create a cross shape. The beads in the border represent my journey alone without my mom, and often feeling like I am going in circles, with the larger buttons representing obstacles to work through. The hole in the heart is actually cut through all the quilt layers. 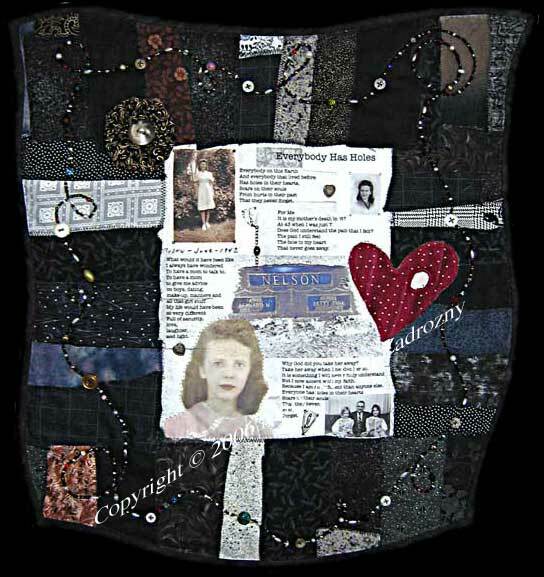 Although the quilt is memorial to my mom, it also suggests that everyone has an event in their life that they will carry with them forever; a hole in their hearts. And although I am not a writer, the words of "Everybody Has Holes" came to me very quickly one evening, line by line, in the most extraordinary way. Materials: Cotton fabrics, polyester batting. Embellished with beads, yo-yo, buttons, jewelry fragments. Techniques: Fusible and Raw Edge Appplique, Photo Transfer, Hand-Quilted. All Rights Reserved. Use of any material from this site for teaching or commercial use is strictly prohibited unless written consent is obtained.